Buy one while they're LEFT! SHARK! SUIT! Be the CENTER of attention, with this FINtastic shark costume. Don't be LEFT out! SHARK suits are so hot RIGHT now. SUPER Quality - best from KATY, Tx to PERRYville, Ky.
BOWL over your friends. Start the party in HALF the TIME. 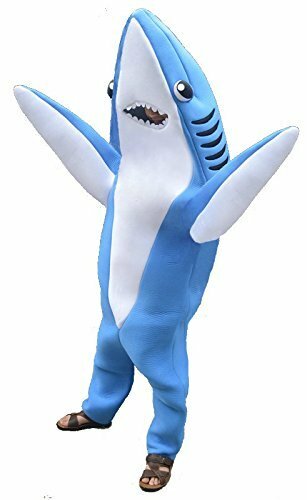 Jokes and puns aside, this is a real shark suit that is actually for sale. Fluffy and plush, you will make JAWS drop when your head shines through that mouth! Have fun and just keep dancing!